A panic bar lock is mandatory on all security systems that lock down gates, doors, and windows in buildings. This button opens all those locks immediately so those inside can escape when necessary. When you have an alarm system installed in your home or office, you need to ensure that this button is working properly at all times. Typically a panic bar lock will work with an electronic signal. When this signal is broken, it will unlock the locks in the system. When you have such security products installed, it's good to have it checked monthly. Very little can go wrong with a panic bar lock but a business especially is liable if persons are locked inside when there is a fire or other disaster. If there are issues with the unlocking mechanism, this needs to be brought to the attention of a locksmith or alarm installer immediately. Having a panic bar lock can also be of safety to the family in the home. When the home is locked down, someone may still break in or you may have a fire, and it's good to have one button that can be pushed so everyone can get out safely rather than fumbling with the alarm system and codes and keys. People tend to panic in emergency situations so it's good to ensure you have everything in place that will allow them to get out safely. As with a business, check your panic bar lock often so you know it works when installed in your home as well. 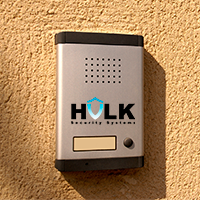 Hulk Security Systems can help you have the best security systems with unmatched expertise.